1.8GHz CPU or higher with SSE2. Windows 10, 8, 7, or Vista . VST 2 and VST 3 compatible host. Supports 32-bit and 64-bit in all formats. Sound card with ASIO driver recommended. To use the automation a Host with automation features is required. Audio Unit, VST 2 and VST 3 compatible host. CoreAudio compliant audio interface or built-in audio hardware. 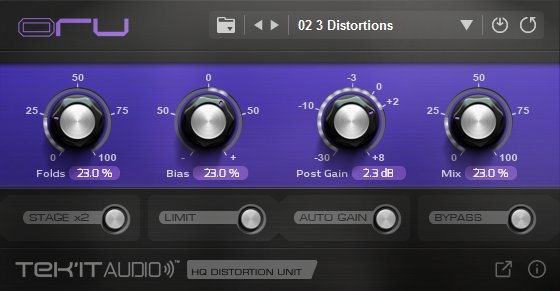 Oru is a high quality wavefolder distortion for VST2, VST3 and Audio Unit plug-in formats. Manipulate the harmonic spectrum to add this little extra, or go heavy into a folded distortion fury by adding bias and doubling the distortion stages. Oru offers powerful wave folding distortion, well suited to distort your synthesizer sounds. Ready to create amazing textures even from a simple sine wave. The interface features a "Mix" control for blending the original sound with the sound of Oru, an "Output Gain" control with auto-gain to keep your level under control and a limiter stage to drive your distortion even further. High quality wave folding distortion. Mix and output gain controls. Value readout on each knob. Preset manager, rename, save, load presets and banks. Up to 16 presets per bank.